The Bio Skin Visco Knee Skin with Thigh & Calf Straps is an excellent all-purpose knee support. The Visco gel ring around the patella provides passive massage to remove swelling and decrease knee pain. The brace is comfortable enough to wear all the time and is very useful a few weeks after knee surgery to control swelling and speed recovery. 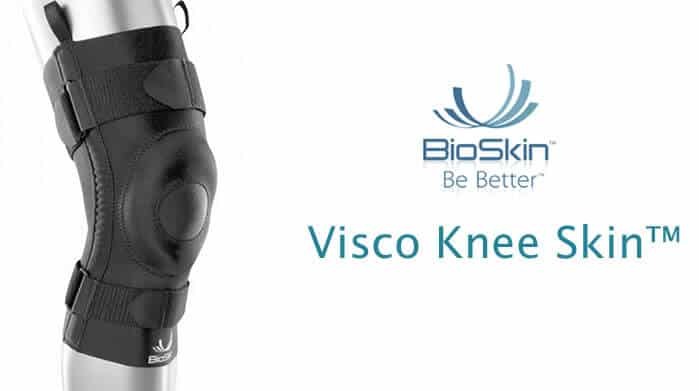 Constructed fromBio Skin’s patented, breathable materials, the Visco Knee Skin gives excellent compression. Finger loops make application easy. The Bio Skin Visco Knee Skin with Thigh & Calf Straps features a silicone ring to reduce swelling and provide passive massage to control edema. This brace is also available with a hinge to improve stability. The silicone ring around the patella provides passive massage to control swelling and reduce pain. The Visco’s Ultima material is amazingly thin and provides high level compression with powerful Lyra and a polyurethane film. The film allows moisture vapor transfer, thus aiding the body’s natural temperature regulation system. Like all Bio Skin materials, Ultima is hypo allergenic and 100% neoprene and latex free. As with all Bio Skin braces, the effectiveness of the Bio Skin Visco Knee Skin knee brace is enhanced by the the SkinLok™ feature. This increases adherence to the skin in the presence of perspiration, thus reducing slippage, even during periods of intense physical activity. With the brace remaining firmly in its intended position, compression will continue to be applied to the required area. As a result, the Bio Skin Visco Knee Skin knee brace will continue to be effective in reducing pain and promoting healing while your patients pursue their normal activities. The above features ensure that the Bio Skin Patella Stabilizer knee brace will be comfortable to wear over prolonged periods. It may also be useful after arthroscopy.